If you’re like me, the full moon gets to you. I’m not saying I start howling or transfiguring or anything, but I certainly have trouble sleeping at night the days before and the day of the full moon. Tomorrow, it goes full, and full moons have quite the effect on ocean animals as well who often time their reproductive cycles to lunar ebb and flow. 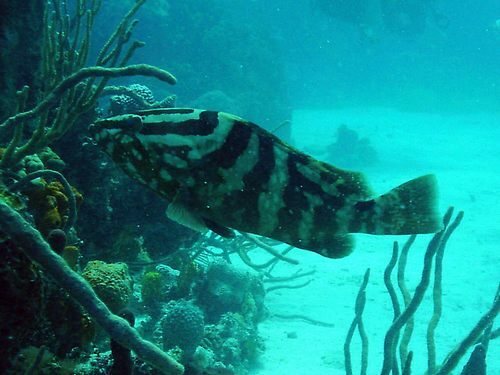 Corals and sea turtles are rather famed for their lunar following in the summertime, but there’s one fish I can think of that aggregates under wintry full moons: the Nassau grouper. Nassau’s are an endangered species, an apex predator in their environment, and a highly prized sportfish. Their faithfulness to spawning sites in the Caribbean and their appearance there by the thousands presents a very tempting situation to fishermen without scruples (or perhaps foresight). Visiting such spawning sites at the right time can easily land them hundreds of pounds of grouper meat.. but also effectively kill a spawning site. One-third to one-half of all known spawning sites are now inactive in the Caribbean. Within the waters of the Cayman Islands, just one remains. The Reef Environmental Education Foundation (REEF) and the Cayman Islands Department of the Environment have joined forces since 2002 to monitor this remaining spawning site, and have developed methods for tracking larval distribution to better understand recruitment and settlement of the little ones in nursery zones. (Score one for the seagrass and mangrove advocates like me, as baby Nassau’s typically need both habitat types at this stage of development.) You can even follow the larvae from this season and years’ past over at REEF’s Baby Grouper Adrift!